The exotic beauty of the deep blue sea and all of its whimsical creatures are united in this flirty pendant. A sleek sterling silver dolphin looks as if it is jumping out of crystal clear water, represented by an oval-cut blue topaz. The pendant dangles elegantly from your chest, mimicking the waves of the ocean. Wear this pendant on your casual Fridays to add a little color and a flair for fun fashion. But first I wanted to tell you Joolwe.com has a new Jewelry Loyalty Reward Program. Anyone can participate, and it's completely free. What does it mean? It means you can earn free jewelry from their reward jewelry catalog, or discount with exclusive coupon codes. You get 1 Gold point per dollar spent purchasing jewelry with Joolwe.com Online Jewelry Store. I loved the 14K white gold multi gemstone ring! How pretty! Would make a nice gift. I loved the diamond/ruby heart pendant. My daughter's birthstone is the ruby as well. I liked the collection of dragonfly jewelry. My 30th Bday is this Sunday October 18th, and my favorite which i would love to have is the Sterling Silver High Polish Two-Tone Double Heart Pendant...I just love it!!!! I like the pear shaped blue and white created sapphire earrings. They are patterned after a sapphire and diamond ring I have. They are very pretty!! I loved the 10k Yellow Gold 5.89 ctw Oval-Cut African Amethyst and Diamond Link Bracelet. I like the Sterling Silver and Double Row Round-Cut Cubic Zirconia S-Ling Eternity Band. I sent a link to their page to give my hubby some hints! i loved the 3 heart dangling necklace! I love the 14k Yellow Gold Pear-Cut Blue Topaz and 0.01 ctw Diamond Exotic Flower Earrings! Why? I love flowers and blue is my favorite color! I love the 14 k white gold heart shaped ring.. love the purple in it.. beautiiifullll. My favorite item is the 10k Yellow Gold Created Blue and White Sapphire Pear-Shaped Post Earrings. They are beautiful. Thanks for the chance to win. I love the Sterling Silver and Round-Cut Cubic Zirconia Cut-Out Classic Heart Pendant . The 18K Gold over Sterling Silver Turquois and Diamond Dangle Earrings caught my eye. I love the Sterling Silver and Five-Carat Oval-Cut Blue Topaz Vintage Inspired Pendant. Thanks so much. I'm a Joolwe.com newsletter subscriber. Loved the other dolphin jewelry at the site. If I win the silver dophin I'm giving to my sister for Christmas. She loves dolphins. my favorite is the 14k White Gold Multigemstone Ring. I love rings even more than pendants. sierramuse8 at aol dot com. My wife's favourite is the Gold Over Sterling Silver Red Cubic Zirconia Exaggerated Open Heart Pendant, thanks. I found out about giveaway on your newsletter. My favorite is the 18k Gold over Sterling Silver Created Stone and Diamond Cross Charm Bracelet. 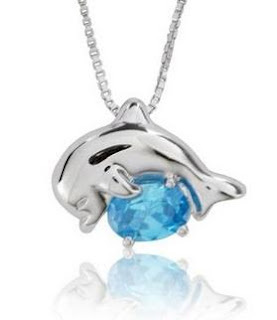 Thanks for the chance to win the dolphin necklace - blue topaz is my birthstone. I signed up to the Joolwe.com Online Jewelry Store newsletter. I like the Sterling Silver Thick-Cut Classic High Polish Hoop Earrings. I like the Sterling Silver Multi-Cut Cubic Zirconia Openwork Fancy Bangle Bracelet. I like the diamond/ruby heart pendant. My favourite item is the 14k White Gold Multigemstone Ring. I especially like the 10K Gold,Blue Topaz,Mother Of Pearl and Diamond Ring-unique design and so gorgeous! I like the very simpe sterling silver hoop earrings with zirconias. Elegant. I like the 10k Yellow Gold 0.93 ctw Blue Topaz, Pearl and Diamond Drop Earrings. Found out abt this on this site. I signed up for joolwe newsletter. I really liked the 10K white gold 3.39 CTW green amethyst and diamond earrings. I would love to have them! My favorite is the 10k White Gold and 0.72 ctw Graduated Round-Cut Ruby Cut-Out Heart Pendant. I love the Sterling Silver 0.25 ctw Openwork Star and Round-Cut Diamond in Heart Pendant! I've had my eye on the gold and diamond Mom heart pendant for quite a while! I like the Gold Over Sterling Silver Floral-Cut Alexandrite and Cubic Zirconia Drop Earrings. I love the 10k White Gold and 4.87 ctw Plateram Quartz and Yellow Diamond Pendant, thanks for the chance! I love hearts. And the 18k Gold Over Sterling Silver and Diamond Accent Dual Hearts Drop Earrings is sweet. Thanks. my favorite is 10k White Gold and Oval-Cut Mystic Topaz and Diamond Fantasy Ring! My favorite is the Sterling Silver and Simulated Pink Corundum Scrollwork Textured Heart Ring in size 6. I'm a Facebook NetworkedBlogs follower - Kitty Cartouche. Thank you! The Silver African Amethyst & Swiss Blue Topaz Dangle Style Earrings. So pretty. Could definitely see the colors of the gemstones thru my dark hair. I just love the 14k white gold and multi gemstone ring. Just my style! i like the Sterling Silver and Cubic Zirconia Puffed Heart Open-Link Toggle Bracelet. thanks! i found this giveaway on prizeatron. thanks! I love the Sterling Silver and 0.25 ctw Diamond Starry Nights Drop Necklace. It's beautiful. I like the Embellished Giraffe necklace. i like the 3 heart dangling necklace! I think the 10k Yellow Gold 0.93 ctw Blue Topaz, Pearl and Diamond Drop Earrings would look absolutely stunning on my wife. I am a regular visitor to read your blog, that's how I found out about this drawing. Thank you for the chance to win and learn about this beautiful jewelry. I love the Sterling Silver Fancy-Cut Sky Blue Topaz European Inspired Solitaire pendant. It's gorgeous! I like the Sterling Silver Geometric-Shaped Marcasite and Hematite Sphere Drop Earrings. I like their Sterling Silver and Marquis-Cut Emerald and Diamond Accent Stackable Floral Rings. It has prescence but looks delicate. I really love the 18k Gold Over Sterling Silver and Cubic Zirconia Classic Cosmopolitan Bangle. I signed up for the Joolwe.com Online Jewelry Store. I found out about this giveaway when I visited to read your blog, I check in a few times a week to keep up with what you're chatting about. I like the Gold Over Sterling Silver Red Cubic Zirconia Exaggerated Open Heart Pendant shown on the Joolwe's site. I'd love this 10k Yellow Gold Black Onyx and Diamond Accent Checkerboard Fashion Ring. I found this giveaway via Sweeties Sweeps. My favorite item is the oval cut amethyst diamond bracelet. 10k Yellow Gold 0.71 ctw Orange Sapphire and Diamond Butterfly Ring. Thanks! i have a passion for heart necklaces and my favourite is the diamond heart interlocking necklace. I love the Sterling Silver Cubic Zirconia Heart Skull and Bones Pendant. Thanks! I like the 10k White Gold and 0.84 ctw Black and White Diamond Encrusted Bat Pendant. I love the Gold Over Sterling Silver Openscroll Round-Cut Garnet Goddess Pendant. Thanks for the great giveaway! I love the pink in the 14k White Gold, Pearl and 0.62 ctw Round-Cut Pink Tourmaline Embellished Ring. I love the Sterling Silver and Oval-Cut Blue Topaz Vintage Inspired Butterfly Bracelet. Real pretty stuff, my fav was Red cubic Zirconia, Exaggerated Open Heart Necklace. My daughter is a senior in high school and dolphins are her favorite and blue is her favorite color. Her room is done in dolphins and every xmas somebody gets her something with a dolphin. I would choose this for her as a gift. I love the Gold Over Sterling Silver and Peridot Blooming Flower Pendant, it's beautiful! diamond ruby heart pendant ty. like the dragonfly pendant ty. The turquoise cuff bracelet was most elegant. Thanks for the wonderful giveaway.